We’re using SQLBackupAndFTP successfully since a long time (Version 10.0.8.29451) on Windows 8.1. Now I’ve moved a MS-SQL Database to an higher MS-SQL Version on an other new Database (MS-SQL Express). 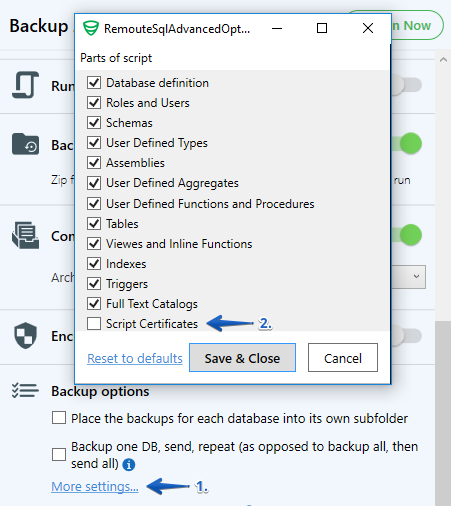 We’ve done this successfully with an productive Database which runs perfect with this version of SQLBackupAndFTP with no problems. So I’ve made a copy of this successfull job and saved it as the “SQLBackupAndFTP-Job for Development” and I’ve changed the Database and the Destination. 01/24/2019 07:54:52	ERROR: Database scripting failed > Script failed for Database ‘master’. > Der Index lag außerhalb des Bereichs. Er muss nicht negativ und kleiner als die Auflistung sein. Strange is that a manual SQL-Backup-Job trough the MS-SQL Management-Studio is running without complains or error-messages. Creating a complete new job runs into the same errors. Could you please try to install the latest release of SQLBackupAndFTP - version 12.1.3 and check if the issue is resolved? 21.02.2019 10:47:34	[Error]	Failed to backup “master” database with “Full” backup type: Script failed for Certificate ‘##MS_AgentSigningCertificate##’. > Script failed. > Cannot script the object with Urn=‘Server[@Name=‘1ddab51ed59b’]/Database[@Name=‘master’]/Certificate[@Name=’##MS_AgentSigningCertificate##’]’. Thanks for the details. We plan to add some changes into the next release that should resolve the issue. We have added some changes to the Alpha version. Could you please install it https://sqlbackupandftp.com/download/alpha and disable certificates scripting option as shown on the screenshot. Thanks for your eMail. I’ve tested your Alpha-Version successfully. It looks very good. Another question : We’re running now a old Version 10 of your product . Is there an upgrade price to get the latest versions? Yes, you can upgrade your SQLBackupAndFTP license key from version 10 to version 12. To do it please go at your SQLBackupAndFTP My Account page and click on the “Upgrade to latest version…” link at the “Actions” column. Please use the email address you have used to purchase SQLBackupAndFTP to sign in. If the password is lost, you can recover it at Forgotten Password Recovery page.